After the drama of discovering that she’s a member of the Storks, a mystical order of women endowed with powerful abilities, Katla Leblanc is finally settling into her life in chilly Minnesota. In fact, the ex-California girl even hopes for a white Christmas. But Katla’s wintry wish unexpectedly turns into the snowstorm of the century, drawing the attention of Brigid, a gorgeous environmental researcher with an amazing array of fur coats and an unusual interest in Katla’s boyfriend, Jack. Do books ever make you hungry for a certain food or thirsty for a certain beverage? Or do they ever make you wish you were in a different season of the year? Frost made me long for winter's chill (we are currently experiencing daily temperatures of 95-103 degrees here in Southeast Texas) and it made me thirsty for hot cocoa. Wendy Delsol's imagery and description were so detailed, so intricate, that I found myself wishing for the trappings of wintertime. Before I go any further, I need to disclose that I have not read Stork, the first in the series. I make a point to only read sequels when I have read the first book, and have no other reason for reading Frost before Stork besides a lack of reading time. 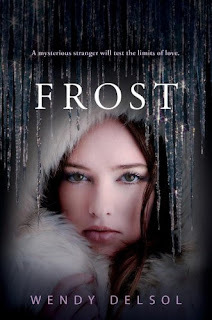 I requested Frost from NetGalley thinking that I would have time to read Stork first, and then when I didn't (remember I have a brand new baby and have not adjusted my expectations of personal time) I had to jump right into Frost, not knowing any of the back story. Thankfully, Delsol provided a nice review at the beginning that filled me in, and I was able to enjoy Frost without feeling like I didn't know what was going on. Several things really stuck out for me about this book. I loved the imagery and the way Delsol sets a scene. I liked the fact that the secondary characters are very well fleshed-out and I found myself just as interested in their stories as I was in Katla and Jack's stories. I thought the premise was so unique and well-executed. Delsol's plot and pacing were great, which kept me reading past the point where I said I'd stop. Katla and Jack were so sweet with their love story. Everything was not roses all of the time, which made the good times more enjoyable for me. Just when I thought I had the story figured out, Delsol threw a wrench in things and added another layer to the plot. I loved that! There were definitely some issues left unresolved, which sets up the next book in the series, and leaves me very interested to read book three. I liked the ending, that the main issues in Frost were resolved, and that I wasn't left frustrated with a cliff-hanger ending, like so many series employ nowadays. Overall, I think the greatest endorsement I can give Frost is that I enjoyed it enough to seek out and read Stork---after reading book two! This one sounds great! I didn't get it from Netgalley because I am just swamped already, and I knew I wouldn't have time to read the first one. Congrats on the new baby btw! I didn't like book one so I wonder if I would dig this one. Great review.